185 s–1 and 18 s–1. important as regards many biotechnological applications. spontaneously, giving rise to polymers. zyme prior to donor adsorption. termediate Compounds I and II. by free superoxide radicals . enzyme bleaching, suggesting haem destruction . the enzyme from inactivation . and Tris-HCl were purchased from Sigma Chemical Co.
rification. H2O2 was from Merck (Darmstadt, Germany). MWCO, 15 mL capacity) were from Millipore Corp.
for o-dianisidine and o-phenylendiamine . mM–1·cm–1 for the protein monomer . steps and their efficiencies are summarized in Table 1. Table 1. Purification of RPTP. estimate the pI of the protein to be around 5.4 ± 0.1 .
mM (●), 0.045 mM (○), 0.053 mM (■), 0.076 mM (□)). rated by an irreversible step). of the Appendix) by an iterative process . ABTS, guaiacol, o-phenylenediamine and o-dianisidine. Table 2. 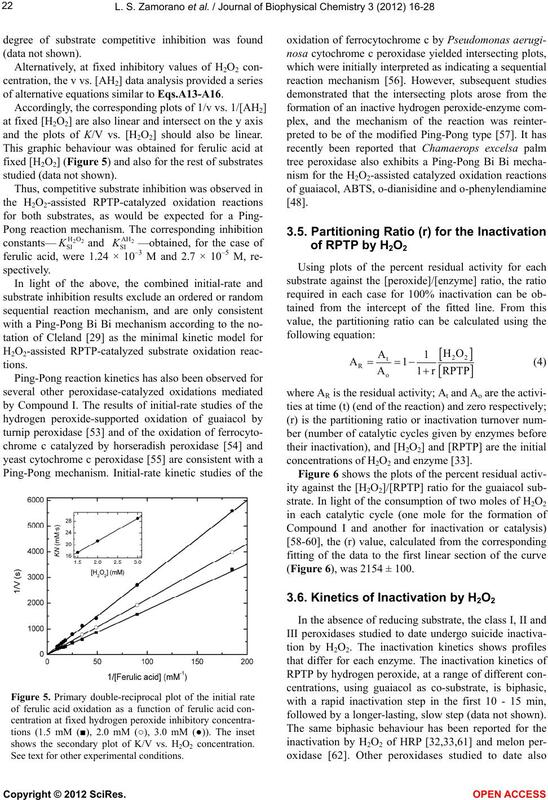 Kinetic parameters obtained for the H2O2-mediated oxidation of substrates by RPTP. See text for experimental conditions. dianisidine, o-phenylenediamine, guaiacol and catechol. together with another enzyme state, designated EII (Eq.2). strate (Eq.3), giving rise to a second free radical (AH•). state approach and considering that k2 > k3. idine and o-phenylendiamine, is also listed in Table 2. H-bond donor sites and guaiacol only one. times less reactive towards o-phenylendiamine . 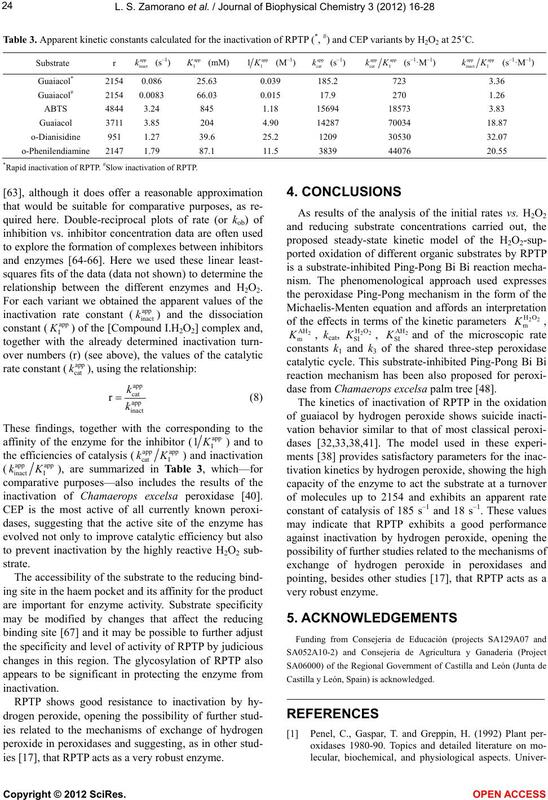 CoI, affording H2O2 and O2 . of alternative equations similar to Eqs.A13-A16. and the plots of K/V vs. [H2O2] should also be linear. shows the secondary plot of K/V vs. H2O2 concentration. See text for other experimental conditions. concentrations of H2O2 and enzyme . (Figure 6), was 2154 ± 100.
followed by a longer-lasting, slow step (data not shown). exhibit different types of behaviour [33,48]. stants of the inactivation (kob, kob′) . pH, and the concentrations of peroxidase and H2O2. become engaged in the catalytic cycle. consumed with relatively little harm to the enzyme . Table 3. 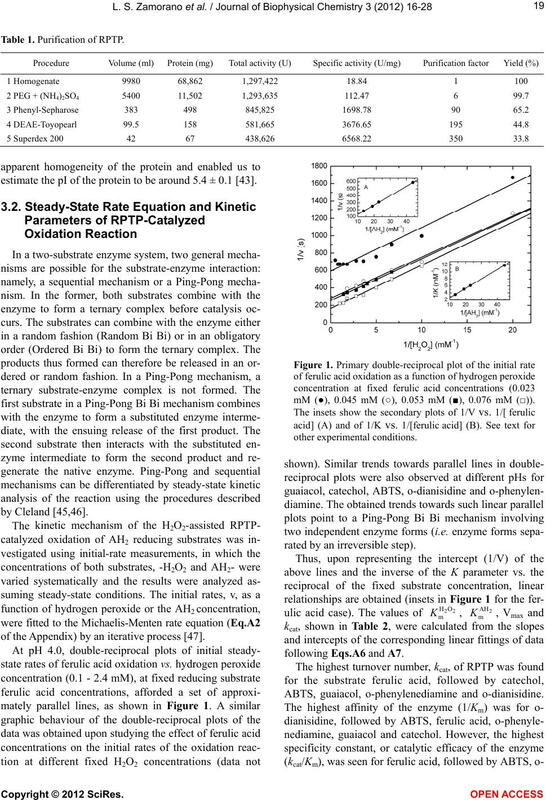 Apparent kinetic constants calculated for the inactivation of RPTP (*, #) and CEP variants by H2O2 at 25˚C. *Rapid inactivation of RPTP. #Slow inactivation of RPTP. relationship between the different enzymes and H2O2. dase from Chamaerops excelsa palm tree . inactivation of Chamaerops excelsa peroxidase . Castilla y León, Spain) is acknowledged. 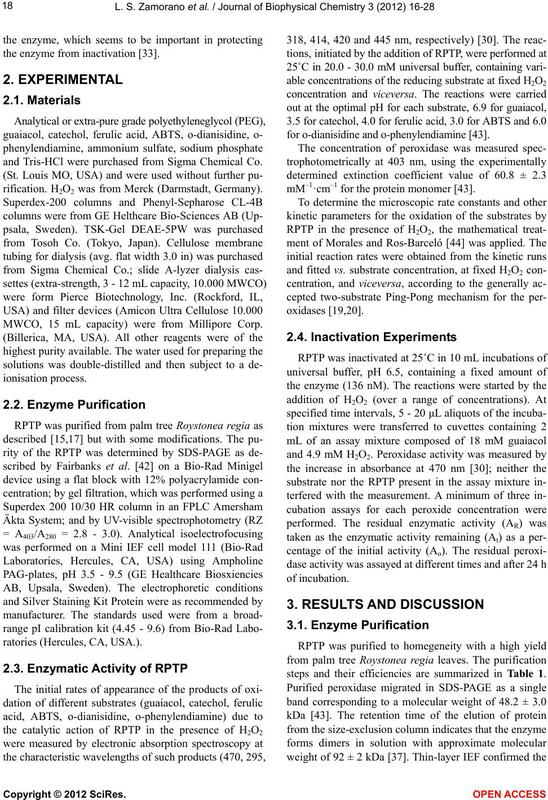 ies , that RPTP acts as a very robust enzyme. Science Part A: Polymer Chemist ry, 29, 1561-1574. Weng, Z., Hendrickx, M., Maesmans, G. and Tobback, P.
radish peroxidase. Journal of Food Science, 56, 574-578.
pounds from water with plant root surface peroxidases. Journal of Environmental Quality, 23, 1113-1117. Zamorano, L.S., Roig, M.G., Villar, E. and Shnyrov, V.L. Schuller, D.J., Ban, N., Van Huystee, R.B., McPherson, A.
culture. FEBS Letters, 398, 243-247.
graphica Section F, 63, 780-783. 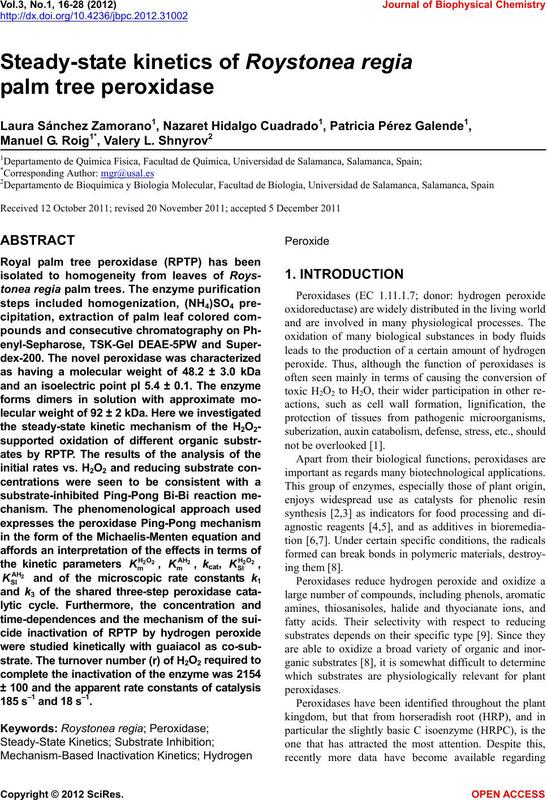 Zamorano, L.S., Pina, D.G., Arellano, J.B., Bursakov, S.
tion of the palm tree Roystonea regia peroxidase stability. G.G., Hidalgo-Cuadrado, N., Bursakov, S.A., Roig, M.G. 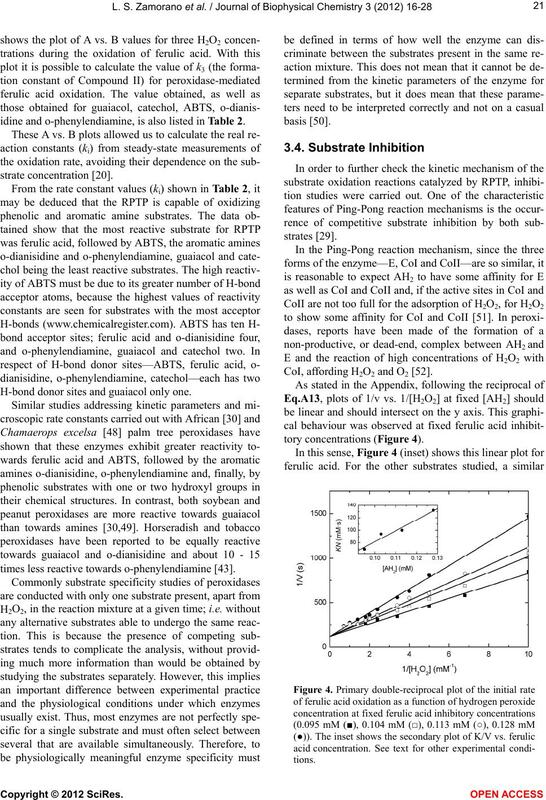 Journal of Biological Macromolecules, 44, 326-332. Rasmussen, C.B., Dunford, H.B. and Welinder, K.G. feryl alcohol. Biochemistry, 34, 4022-4029. Hiner, A.N.P., Garcia-Cánovas, F. and Thorneley, R.N.F. noassays. Elsevier Science Ltd., New York. Substrate specificity of African oil palm tree peroxidase. chimica et Biophysica Acta, 1038, 85-89.
ropean Journal of Biochemistry, 234, 506-512. Puiu, M., Răducan, A., Babaligea, I. and Oancea, D.
and Biosystems Engineering, 31, 579-586. 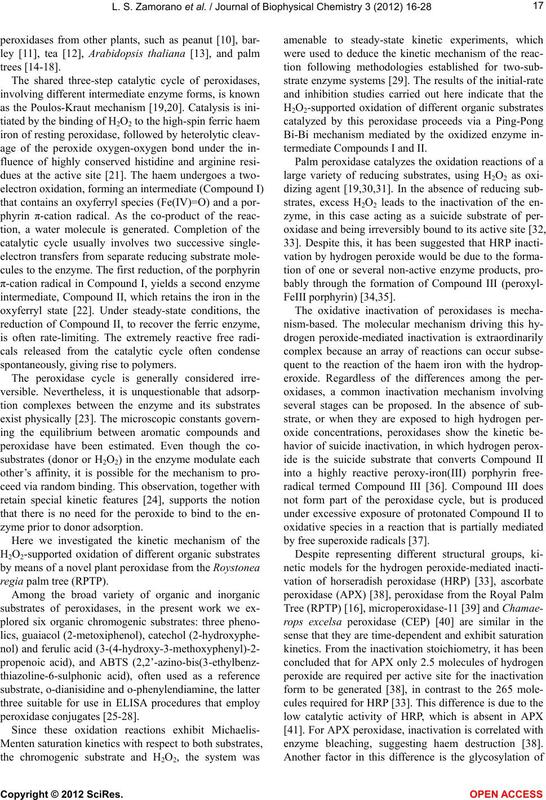 Journal of Biochemistry, 186, 571-576.
hydrogen peroxide. Biochemical Journal, 348, 321-328. Nazari, K., Mahmoudi, A., Khosraneh, M., Haghighian, Z. 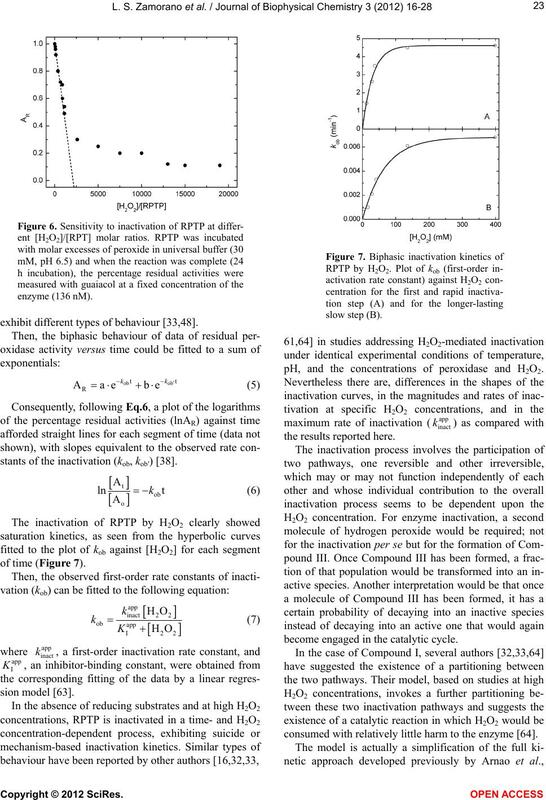 Journal of Biological Macromolecules, 49, 1078-1082.
vation by H2O2. 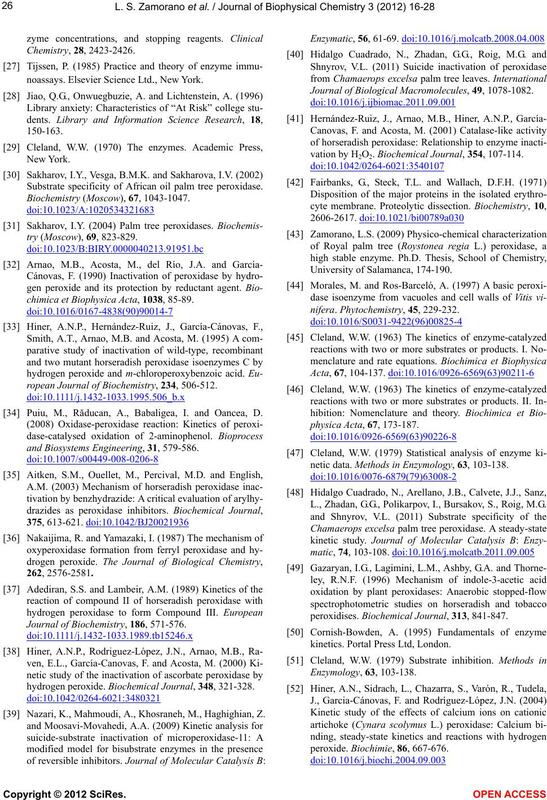 Biochemical Journal, 354, 107-114.
netic data. 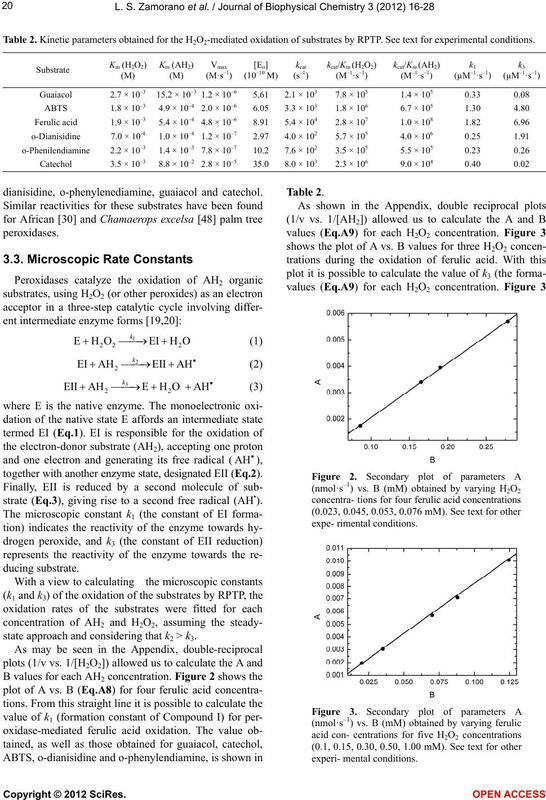 Methods in Enzymology, 63, 103-138. L., Zhadan, G.G., Polikarpov, I., Bursakov, S., Roig, M.G. peroxidises. 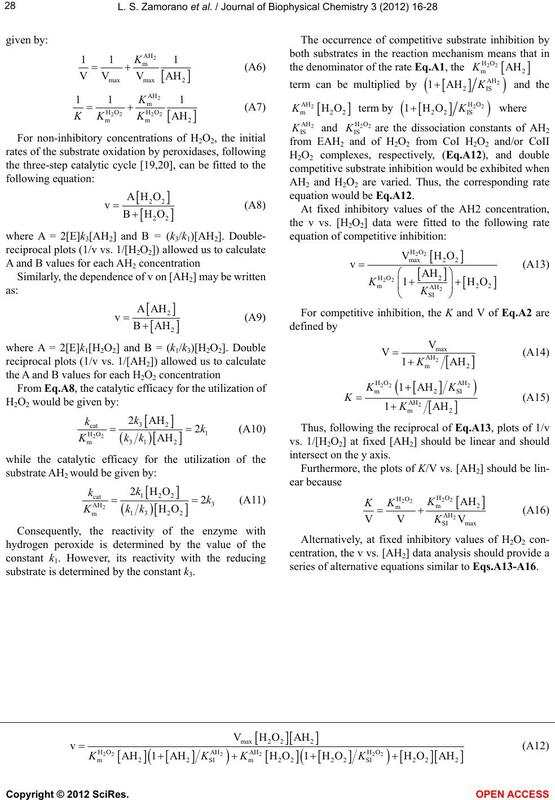 Biochemica l Jou rnal, 313, 841-847.
kinetics. Portal Press Ltd, London. ferrocytochrome c catalyzed by cytochrome c peroxidise. 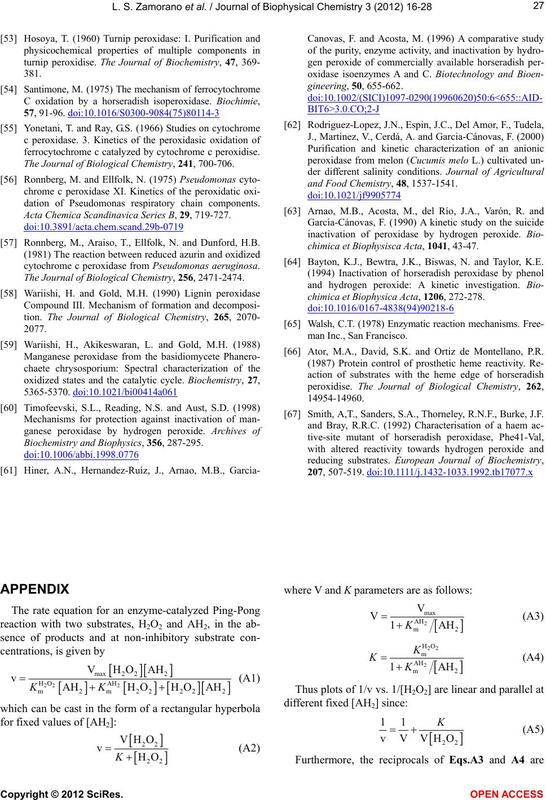 The Journal of Biological Chemistry, 241, 700-706.
dation of Pseudomonas respiratory chain components. Acta Chemica Scandinavica Series B, 29, 719-727. Ronnberg, M., Araiso, T., Ellfolk, N. and Dunford, H.B. cytochrome c peroxidase from Pseudomonas aeruginosa. 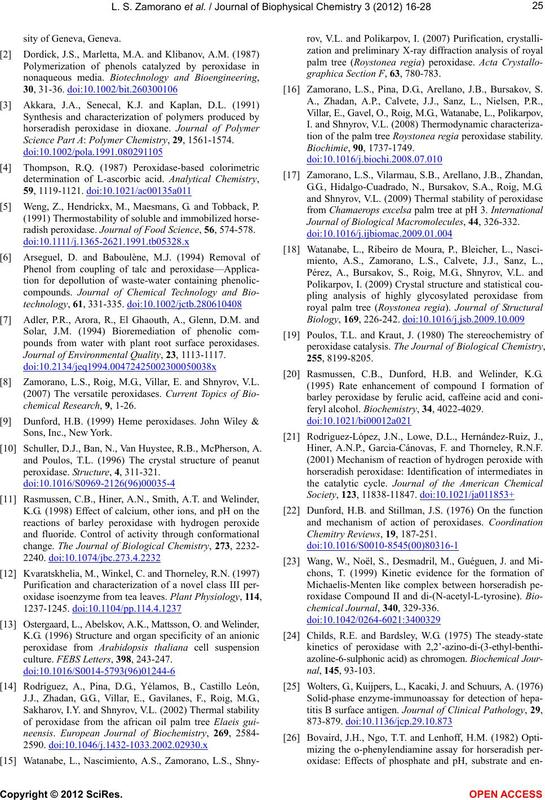 The Journal of Biological Chemistry, 256, 2471-2474. Biochemistry and Biophysics, 356, 287-295.
and Food Chemistry, 48, 1537-1541.
chimica et Biophysisca Acta, 1041, 43-47. Bayton, K.J., Bewtra, J.K., Biswas, N. and Taylor, K.E. chimica et Biophysica Acta, 1206, 272-278. Ator, M.A., David, S.K. and Ortiz de Montellano, P.R. Smith, A,T., Sanders, S.A., Thorneley, R.N.F., Burke, J.F. substrate is determined by the constant k3. intersect on the y axis. series of alternative equations similar to Eqs.A13- A16.